My Fancy Nest | Food. Fashion. Decor. There are few things that capture the taste of summer like a freshly-assembled Caprese salad made of perfectly-ripe heirloom tomatoes. It is my go-to dinner on a hot summer day. There is no cooking involved and my kids love the assembly process. The mozzarella is so hearty that a large Caprese is a satisfying and nutritious meal. Over the years, I have made little discoveries about the method of preparing the salad that elevates a simple salad to one that showcases it’s star ingredients. 1. Select perfectly-ripe tomatoes of different colors. I am a strong believer that we eat with our eyes first (especially the kiddos!). My grandmother always used to tell me that the colors in fruits and vegetables are visible signs of the vitamins they contain. Besides, how can I not show off the bursting color varieties of peak-of-season heirlooms? Selecting different colors of ingredients is like choosing the color palette that the final dish will be painted with. In this case, the season gives us a cornucopia of options. 2. Cut tomatoes into wedges. I like to ensure that each bite of the salad retains as much integrity of each ingredient as possible, that is why I cut the tomatoes into wedges, instead of slices or cubes. By cutting the tomatoes into 1″ wide wedges (just like cutting orange wedges), each bite retains more of the tomato juice and seeds. When tomatoes are sliced, diced, or cubed, the juices pour right out when the salad is tossed. 3. Tear, not cut, the mozzarella. The fresh mozzarella is a star ingredient of the Caprese and I see my role in incorporating the star ingredients is to make sure they don’t compete with each other, but instead highlight each other’s beauty. I choose the large balls of fresh mozzarella that are sold floating in water. Then, instead of dicing them like I would for any other dish, I rip it into pieces with my hands. What happens is the mozzarella tears along the natural threads of its composition. Those threads create ridges to which the seasoning and juices of the salad stick, creating a gorgeous flavor and rustic texture. 4. Freshen up the basil. Oftentimes I purchase basil ahead of time, since it comes in large bundles in the summer. To make sure my basil is as fresh as possible, I treat it like flowers: trim the ends of the bushel and stick it in a jar with water. Then when I am ready to use it, it is as fresh as it would be if I picked it from the garden. 5. Use very good olive oil. Olive oil is the fourth most important ingredient in a Caprese. Choose wisely. I use a California extra virgin olive oil I picked up in the Santa Ynez valley. Simple rule of thumb for me is if the olive oil is good enough to serve for dipping bread, then it is good enough for a Caprese. It is important to prepare this salad immediately before serving to really get the full flavor of each ingredient. I love the simplicity and rustic feel of a huge bowl of freshly-prepared Caprese. There is no better way to showcase the gorgeous peak-season heirloom tomatoes that are bountifully available mid-summer. My favorite way to serve it is with a hand-torn piece of rustic bread with grass-fed butter. Other ideas: I have been known to implement improvise the Caprese disguised in other dishes. For example, tossing this salad over freshly cooked whole wheat spaghetti. Another simple idea is to throw it atop of a pizza crust and bake for 15 minutes at 425 degrees. Another variation on a theme is to carefully slice the tomatoes into rounds, place on a plate, and top with the mozzarella pieces (creamy buffalo mozzarella can be substituted here for a more decadent treat) and chopped basil. Add olive oil, salt, pepper. This entry was posted in Dinner, Salads and Sides, Snacks and tagged basil, caprese, heirloom tomatoes, salad, snacks, summer, tomatoes. The Fourth of July is one of my favorite holidays. To me, the day symbolizes the epitome of summer. Between the watermelon slices, beach time, barbecues, and fireworks, I could not make up a more perfect holiday. Especially now that I have kids, I love spending the day with friends and family, and creating summertime memories. I love the Americana charm and patriotic colors that the day brings. I created the Blueberry Liberty Tart to celebrate all things Fourth of July. This tart is loved by all (the kids go crazy for the stars! ), but my favorite thing about this tart is that it can just as easily be served for brunch as it can for dessert. The tart may look like a light dessert, but there is a hearty layer of farmer cheese (ricotta style cheese common in Russian cuisine) below the bountiful blueberry topping. The protein-rich layer makes this a perfect brunch dish, which for me is usually the first meal of the day on a typical Fourth of July weekend anyway. Both of my kids loved making the stars for the top of the tart. We even made some extra from the leftover dough in different sizes to bake separately. We chose the smallest 2″ size stars for the top of the tart. We made about 20 in case some didn’t turn out perfectly. Step 2: Prepare the pie crust. While the stars are baking, place the second pie crust into the tart pan. Gently press all areas of the dough to the pan. With a fork, gently puncture the top of the dough all around the pan. This will prevent air bubbles, which can cause the dough to bake unevenly, from being trapped in the dough. Step 3: Combine the farmer cheese, a tablespoon of sugar, and the egg in a bowl and mix well. Then spread the mixture in an even a 1/2 inch layer over the bottom of the dough. Step 4: Evenly distribute the blueberries over the top of layer of farmer cheese to cover the cheese completely. Do not worry about putting in too many blueberries, since they will bake down. Sprinkle the blueberries with 1/4 teaspoon of flour and 1 tablespoon of sugar. Place into the oven that is already preheated to 350 degrees. Bake for 20-30 minutes, checking the tart regularly. It is ready when all of the blueberries have turned a deep dark blue color and all the sugar has baked into blueberries. Remove and allow the tart to cool completely on a cooling rack. Step 5: Finally, place the baked stars evenly on top of the tart and serve. I love serving this tart on a red and white striped napkin to emphasize the patriotic feel of the tart. Enjoy! This entry was posted in Brunch, Dessert and tagged blueberries, brunch, dessert, july, picnic, summer, tart. Regardless of your kitchen size or design, these inspiring kitchen ideas will help you transform your kitchen from just a room to a place of inspiration where you can create beautiful meals. We would all love to have perfect, sparkling kitchens worthy of a magazine spread or the Food Network, complete with a professional range and ever-expanding counter tops with unlimited space (like Ina Garten’s as seen here). The reality is, most of us would like to change something about our kitchens – whether its the design or the space, or the appliances in it. Recently I found myself going through an uninspired phase in my kitchen. I didn’t like the wall color, the counter tops are too small, etc. But then I realized that if I just changed a few things around, I could create an inspiring space. I have collected my top 10 inspiring kitchen ideas here to share with you. I have found that if I stick to these 10 core ideas, it is very easy to keep my kitchen a place of inspiration. (Above image is Ina Garten’s kitchen, which was featured as House Beautiful’s Kitchen of the Year in 2009). 1. Easy Access to Fresh Produce. After coming home from the market, I like to set key ingredients within view. For example, tomatoes, lemons, limes, and almost all fruit get a special place on the counter. Not only do they look great, but they are easily accessible amidst the flurry of cooking. I put garlic into a garlic keeper that sits within reach. Potatoes, sweet potatoes, and onions get a home in covered woven baskets. For all herb ingredients, I treat them like flowers: I trim the stems a bit and place them into small mason jars near the window. This helps them stay fresh and prevent them from wilting. My bowl of fresh fruits and veggies, currently. 2. Expose Useful Equipment. Although counter top real estate is scarce around my kitchen, I find it is worth it to devote an area of the counter top to equipment I use on a daily basis. My precious Vitamix would not get nearly the use it currently does if it were stored away in a cupboard. The same is true of our Nespresso Pixie machine and KitchenAid mixer – each has a home on the counter. I find the tradeoff of sparing a chunk of counter space in exchange for the usefulness of having a highly used appliance an easy choice. Hauling a heavy appliance out of a cupboard can be very uninspiring, so I do my best to avoid it. Ina Garten keeps her appliances exposed as well. 3. Fresh Potted Herbs. Nothing creates an inspiring kitchen environment like the delicate fragrance of fresh herbs. I like to keep a small potted garden in my kitchen. Mine ideally consists of rosemary, mint, chives, and oregano. These also happen to be my most-frequently used herbs, and when I need a sprig, I simply snip it off the plant. 4. Preparation. The night before I know I will be making something the next day, I try to make sure all the dishes are loaded into the dishwasher and there is no clutter on the counter tops. This is sometimes a practice in absurdity because there is always a high likelihood that of one of the three other residents of my household will make some kind of mess. I try not to sweat the small messes and go into zen mode while cleaning up an unexpected spill or otherwise. Also, see #10, below. 5. Streamlined Order. While it is difficult to keep my kitchen in pristine organized condition, I focus on a few key areas that I always try to streamline and keep in order. Streamlining in this situation means keep like with like and put them in easy to reach places. For me, it is very important to keep all my knives well organized on a hanging magnetic strip in an easy-to-access place, all measuring cups and spoons in one place, mixing bowls stacked together in a cupboard, and all wooden spoons and utensils in an organized canister. Little things like keeping all wooden spoons in one canister and all other utensils in another (a little trick I picked up from Ina Garten) may go a long way in keeping a tiny kitchen easy on the eye. 6. Open the Windows. I realize this is not always a realistic thing to do, but climate and architecture permitting, opening a window or at least pulling open the shades in your kitchen could be a huge source of inspiration. Let nature’s elements in to your kitchen, whether it be natural light, a breeze, or maybe even some rain (ok maybe not that one). One of my favorite features of my currently teeny tiny, outdated kitchen, is that the main window faces a giant jasmine bush that blooms like crazy every spring. That is one of my favorite seasons to be in that kitchen! Just the thought of that intoxicating smell is enough to make me cook every single meal of the day. 7. Add Some Music. Nothing creates a mood like music. Music is one of my go-to inspiration in the kitchen. Ideally, I have an iPod doc and speaker permanently planted somewhere in the kitchen so I can easily pop my playlist in. I put on whatever the mood calls for – sometimes Vivaldi, other times, Maroon 5. But one of my favorite things to do is to turn on music on the theme of whatever I am preparing. For example, if I am preparing Italian, Andrea Bocelli may be soundtrack of choice. You get the idea. 8. Personal Touches. I like to keep a few personal decorative items in the kitchen that remind me of places to which I have traveled or places to which I would like to one day go. Something about far-off places and memories of travel makes me want to create another memory with whatever I am preparing. Art has a similar effect. An element of whatever inspires you in general should have a presence in your kitchen. I love this Etsy store with photographs of travel destinations and vignettes. I love this photograph by Rebecca Plotnick I found over on Etsy. Reminds me of the time I spent in Paris. 9. Cookbook Collection. Like old friends, my cookbooks are constant companions to my adventures in cooking. I try to keep at least a few of my favorite cook books out in my kitchen and frequently rotate them based on my mood and the season. Refreshing the display can also inspire the exploration of a new ingredient or recipe. There is something inspiring about the amount of work and love for food that went into the creation of a beautiful cookbook. I like to think that I will gain something by way of osmosis from the experts between the covers. The cookbooks that are currently gracing my little cookbook corner. 10. Attitude. Finally, the most important element of an inspired kitchen is your attitude. The truth is, we all deal with environments that are less than inspiring, no matter where we are. But if we maintain the perspective that there is inspiration in imperfection and surrender to the flow of the process, a little toddler tornado or less-than-sparkling kitchen will help us be in the moment. Isn’t that the point anyway? To be in the moment of the process. One day, my son kept running in circles around me when I was trying to prepare a lamb dinner. I was getting frustrated that he kept interfering with MY process. Then I realized I can’t fight it anymore – I pulled up a step stool and gave him a mixing spoon. He was elated. And we had the best time together. I surrendered to THE process and let go of MY process and the result was an inspiring memory of preparing dinner together. For me, there is a distinct element of inspiration that is necessary for the creation of a beautiful meal, especially if a new recipe is involved or a special occasion is on the horizon. The more inspired I feel, the more inspiring my table turns out. My kitchen is by no means perfect — in fact, it is far from that thanks to my two adorable toddlers who run through it like tornadoes on a regular basis. (It is not uncommon to find pieces of the previous night’s dinner wedged into a drawer or other art along those lines… you get the picture). But I have found that even my tiny, imperfect kitchen can feel like a field of inspiration if I stick to a few simple rules. I thought I would share the things that keep my kitchen an inspiring place to create (despite the occasional tornado!). I hope my list helps your kitchen feel like a more inspiring place to create. If you have any other ideas or would like to share how any of these tips worked out for you, please let me know in the comments below! This entry was posted in Decor, Kitchen. Eastern Europeans take their pickled foods very seriously. This is especially true for Russians. No self-respecting Russian would even think about sitting down to a dinner table if it did not have pickles, rye bread, butter, and fresh garlic on it. As someone who was born in Russia and lived there for the first seven years of her life, I am no exception. I am afraid to say that with all the home pickling that went on in my home as a child by my mom and grandmother, I have grown up to be somewhat of a pickle snob. Or perhaps such snobbery is genetic, since my kids were basically born with a discriminating pickle pallet – don’t try to offer a Claussen to my son without receiving a concerned look of pity in return. Regardless of the level of pickled-good appreciation in your household, if your household is anything like mine, pickles are a high-value commodity (second only to stickers of dinosaurs). If I tell my kids that I will give them pickles with their dinner, they are likely to clean their plate without question. My husband is another matter altogether — he can practically smell when my pickles are ready and proceeds to ‘taste’ them to ‘make sure they are ready’ as soon as he can get his hands on a clean fork. Needless to say, a liter-sized jar does not last long around here and it is not uncommon to witness a multi-stage pickle station in my kitchen. Homemade pickles are one of the best and easiest ways to introduce probiotics into your diet without having to go to extensive lengths of drinking tonics, kombuchas, or potions. Everyone (almost) loves pickles and when they are homemade, all the probiotic benefits of them are preserved in their highest capacity, since they are not at all processed. To make things even more appealing, my recipe is so easy that I challenge you not to memorize it by heart. My mom taught it to me and it is fool-proof. If I can do it, you can do it. Believe me. And the results are always phenomenal. But of course, like all good things, these fancy pickles must start with fresh, beautiful ingredients. Like most of my dishes, the inspiration begins with the ingredients at the market. This time it was at the Manhattan Beach Farmers Market and the source of inspiration was a cornucopia of perfect little organic cucumbers from Rodriguez Family Farms. These were not your average cucumber. These were gorgeous, perfectly green, and perfectly asymmetrical little beauties that basically leaped into my bag and begged for me to take them home and pickle them. So I did. I also picked up some dill and fresh young garlic. Believe it or not, these three ingredients (sans the kosher salt, organic sugar, and water) were the basic ingredients necessary for my homemade pickles. Step 1: Using half of the bunch of dill, line the bottom of the glass jar and sprinkle in half of the roughly-chopped garlic. Step 2: Stack in as many cucumbers as you can into the jar on top of the bed of dill and garlic. I find that the best way to get in the largest number of cucumbers is to begin stacking them along the perimeter of the jar to make a circle of cucumbers and then jam a few into the center. Then proceed to make a ‘second floor’ using the same pattern. If your jar will not allow this, don’t worry and just stack them in as best you can to utilize most of the space in your jar. Then sprinkle half of the remaining garlic on top of the packed cucumbers. Place half of the remaining dill on top, sprinkle the rest of the garlic and place the remaining dill on top of the cucumbers like a nice cozy blanket. Compact it down lightly. Step 3: Finally, dissolve the salt and sugar in the room-temperature liter of water and pour the mixture into the jar until it covers all the ingredients and no dill is sticking out of the top. Step 4: Finally, without allowing it to touch the pickle brine solution inside the jar, carefully place your paper towel or cloth over the opening of the jar and secure tightly with the rubber band. Place the jar in a well-lit place (perhaps by a window) so that it is exposed to UV light during the day and allow it to sit undisturbed for three days. On the third day or so, you will notice that the brine in your pickle jar as become cloudy. This is a good sign! This means the pickles are pickling away. You may open the jar and using a very clean fork, take out a cucumber to taste. The length of time you allow the cucumbers to pickle is a matter of personal taste. The longer they pickle, the more sour and pickled they will become. This is also true if you are experiencing very warm weather. The warmer the weather, the less time it will take for the pickles to mature. If you feel the pickles are not ‘pickled’ enough, let them sit undisturbed for a fourth day. Once you feel they taste right and are ready, remove the paper or cloth covering, replace it with an air-tight lid, and place into the fridge. These refrigerate well will last up to two weeks. The official last step of the pickling process is to feed your delicious pickle to the nearest pickle monster. For me, this happens to be my son. My daughter, who is a year and half younger, is catching on quickly as well. This entry was posted in Salads and Sides, Snacks and tagged cucumbers, farmers market, homemade russian pickles, organic, pickles, russian pickles, side, vegetables, vegetarian. I find inspiration everywhere I look – that is doubly true in the springtime when flowers are blooming and the days are turning warmer. Here are some things that were particularly inspiring (and fun!) for me this week. As evidenced by my Instagram feed, I have a serious infatuation with flowers. I know I am not the only one enamored with Peonies, but I just can’t help it. They are simply perfect and their blossoms inspire me to remember to live life fully and beautifully. Everyone knows I am kind of obsessed with my Gold Piggy Bank from Areaware. It sits on my desk and reminds me not to take life too seriously. I put bills and coins in there from time to time, as well as little notes about my family, goals, etc. In my household, anything with animals on it (especially dinosaurs) is sure to be a hit. Pair that with a rolling pin used to make cookies, and my kids are over the moon. 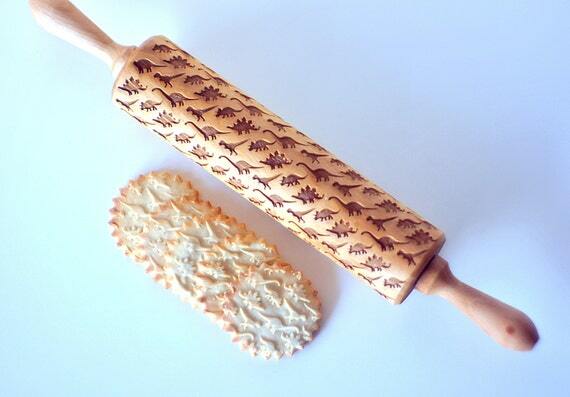 Loving this handmade dinosaur rolling pin from Valek Rolling Pins in Poland. This entry was posted in Favorite Things and tagged areaware, dinosaur rolling pin, gold piggy bank, inspiration, peonies, pink peonies.